Experience freedom and sonic bliss with these ZOLO Liberty wireless earphones. Access your smart assistant for voice commands via the built-in microphone of these sweat-resistant ZOLO Liberty wireless earphones. Unlike many truly-wireless earphones, Liberty Air provides in-ear stereo calls. For crystal-clear voice pick-up, the dual-microphones are equipped with uplink noise reduction technology to filter out ambient noise. ANKER Soundcore Liberty Air Total Wireless Earphones. Model: A3902. USER GUIDE. We promise to work with you to make things right, just give us the chance to do so. Fair enough?. CHARGING CASE. ORIGINAL BOX (BOX MAY BE DISTRESSED). We Have Continually Grown By Providing Quality Deals At Low Prices. Quality Tested. Fair Pricing. 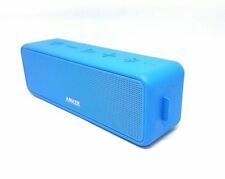 SOUNDCORE ANKER LIBERTY AIR. Unlike many truly-wireless earphones, Liberty Air provides in-ear stereo calls. For crystal-clear voice pick-up, the dual-microphones are equipped with uplink noise reduction technology to filter out ambient noise. Zolo Liberty Wireless Earphones by Anker. 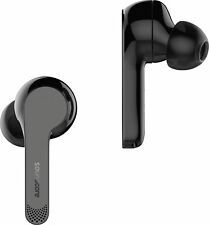 ANKER Zolo Liberty Wireless Earphones Bluetooth Earbuds Graphene Drivers. With no cords or wires to tie you down, Total-Wireless Earphones will change the way you listen to music forever. 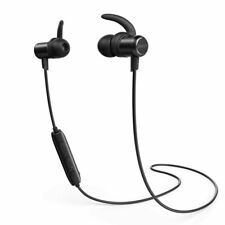 Bluetooth earbuds with neckband and long battery life. Versatile Anker Sound Buds Life have it all, from magnetized earbuds to water-resistant design. Fees Apply. 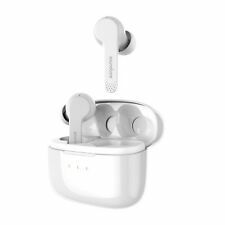 Anker Soundcore Liberty Air True Wireless Earphones - White. Shipped with USPS Priority Mail. New open box/ minor box distress ( see photos) new condition tested and working great! RETURN POLICY- RETURNS ARE NOT ACCEPTED SO PLEASE LOOK AT ALL PHOTOS AND ASK ANY QUESTIONS BEFORE PURCHASING THANK YOU!! Enjoy up to 15 hours of music from Bluetooth-enabled devices with these Soundcore Liberty Air earphones. Their custom graphene-coated drivers produce high-quality audio, and uplink technology on the dual microphones reduces ambient noise. Look like new in open box. Anker Soundbuds Sport A3233H12. Water Resistant. Headphones Soundbuds Sport. In-Ear Hooks. 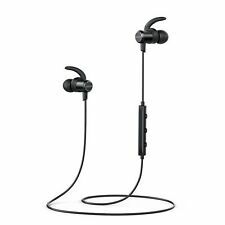 ANKER Zolo Liberty Plus Wireless Earphones Bluetooth Earbuds Graphene Drivers. With no cords or wires to tie you down, Total-Wireless Earphones will change the way you listen to music forever. Take your workout to the next level and or escape from the boredom of your commute. We Have Continually Grown By Providing Quality Deals At Low Prices. We carefully inspect each used item to make sure have minimal or no scratching. You can expect a fully functional product. This is in USED CONDITION. We Have Continually Grown By Providing Quality Deals At Low Prices. We carefully inspect each used item to make sure have minimal or no scratching. You can expect a fully functional product. USED PRODUCT. For sale is a pre-owned, Zolo Liberty Totally Wireless Headphones. The Zolo Liberty’s feature graphene-enhanced sound drivers. It is water/splash/sweat resistant, which makes it perfect for workouts. Liberty are one of the first total-wireless earphones to utilize graphene-enhanced driver technology. Liberty gives extended wireless freedom to the most music-hungry listeners. Zero compromise. Probably the most advanced total-wireless earphone series in the world. Soundcore Space NC. Noise Cancelling Technology. The Headphones with Hybrid Active Noise Cancellation. Space NC's active noise cancellation constantly studies the world around you to ensure ambient noises are blocked out. NEW Anker SoundCore Nano Pocket Bluetooth 4.0 Speaker Tiny Body Huge Sound GRAY. Condition is New. Shipped with USPS Priority Mail. MPN A3145011. This is ANKER Sound. Type Portable Speaker System. Connectivity Wireless. Compatible Model Universal. OPEN BOX, all accessories included, Working like new. Color Black. GTIN 0848061063738. Charging case. With Charging Case: More than 24 hours. GripFit: Comfortable use and secure fit. Push And Go: Fast pairing to your phones Bluetooth. ANKER SoundBuds Sport NB10. Bluetooth Headphone Sport Earbuds Sweat-Proof Secure. The item is in excellent, new condition with no wear & is not missing anything (see pic). Charging case. With Charging Case: More than 24 hours. Smart assistant access for optimized voice recognition. GripFit: Comfortable use and secure fit. Push And Go: Fast pairing to your phones Bluetooth. Box has been opened and earbuds tested but otherwise new and unused, in perfect condition. 1x Soundcore Liberty Lite. Our smallest and lightest truly wireless earphones ever. Liberty Lite's graphene-coated drivers are rigid, yet light. They produce precision oscillation for superior sound across the entire frequency range. Soundcore 2 produces outstanding audio from an astonishingly compact speaker (165mm 54mm 45mm). upgraded 2x 6W drivers blast out rich, clear sound. from Anker, the choice of 20 million happy users. Soundcore Space NC. What You Get: Soundcore Space NC, AUX cable, micro USB cable, hard-shell travel case. Noise Cancelling Technology. The Headphones with Hybrid Active Noise Cancellation. Experience a purer music experience, without distracting external noises. NEW Open Box. Fully Functional. Anker Soundcore Life 2 Over-Ear Bluetooth Headphones,. Shipped with USPS Priority Mail. Includes original box, case, accessories. Enjoy music on-the-go with these Anker SoundBuds Sport NB10. 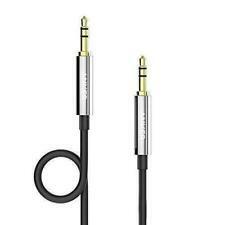 These headphones are also equipped with Bluetooth Version 4.0 and a built-in microphone for multi-use convenience. Advanced Technology: Universally compatible, portable Bluetooth 4.1 headphones work with any Bluetooth-enabled device (including iPhone 7). 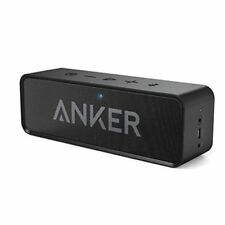 Anker SoundCore Select Portable Bluetooth Speaker Black A3106H11 - Micro USB Cable. Built-in microphone. IPX5 rated. Pair this speaker with your smartphone, tablet or other Bluetooth-enabled device.